Dwarf Galaxy Formation - Universe Galaxies And Stars Section. Milky Way dwarf satellite galaxy discovered. Milky Way Dwarf Satellite Galaxy. Some current models of Galaxy formation predict that large spirals such as the Milky Way and Andromeda Galaxy should have more satellite Galaxies than are currently known to astronomers. Many of these Galaxies should be much smaller than those already discovered. Astronomers reviewing data from the automated Sloan Digital Sky Survey (SDSS) have now added a tenth satellite to the Milky Way's dwarf spheroidal Galaxy contingent and this one is a real lightweight. Large spiral Galaxies such as our own Milky Way are like huge sprawling continents in space. Like any continent, such Galaxies should have many smaller islands lying off the coast. Current models of Galaxy formation suggest that galactic continents should have more neighboring islands than actually seen with telescopes. Now one more island has been added to the Milky Way's contingent and this one is small enough to map well against predictions. Other dwarfs - like the one recently discovered in Ursa Major - are likely to follow. Located 300 thousand plus light-years away in the direction of the Big Dipper, the recently discovered Ursa Major (UMa) dwarf Galaxy has roughly one-tenth the surface brightness of the next smallest Milky Way dwarf (located in Sextans). Like the Sextans dwarf, the UMa dwarf is spherical in shape (galaxy type dSph) and is in some ways similar to globular clusters which are also found in association with large spiral galaxies. 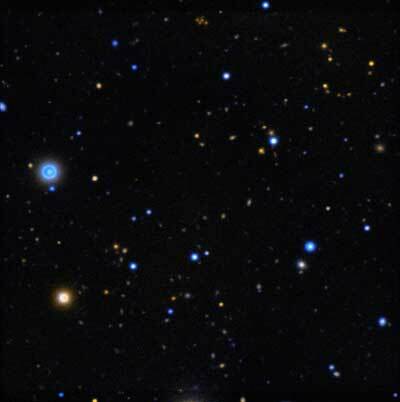 According to Beth Willman of New York University - principal investigator of a team of 15 Astronomers studying data returned by the Sloan Digital Sky Survey (SDSS), "Ursa Major appears to be old and metal poor, like all of the other known Milky Way dwarf spheroidal companions. However, it may be 10 times fainter than the faintest known Milky Way satellite. We are in the process of obtaining more detailed observations that will provide a more detailed picture of UMa's properties, which we will then compare with the other known satellites. Beth goes on to explain, "UMa was detected as part of a systematic survey for Milky Way companions. It was detected as a slight statistical fluctuation in the number of red stars in that region of the sky." All Galaxies and globular clusters include a wide range of stellar types in their makeup. These range from young, massive, short-lived, intensely bright blue-giants, through longer-lived, modestly massive, mostly middle-aged fainter yellow stars such as our Sun, to old, moderately bright, but hugely swollen red-giants similar to Scorpio's Antares and Orion's Betelguese. When it comes to finding nearby dwarf Galaxies - such as the UMa dwarf - it is this last group of stars that are of especial interest. Red-giants are bright enough to be detected, identified spectroscopically, and counted using automated sky-surveying Telescopes such as the SDSS in New Mexico - even from small satellite Galaxies located several hundreds of thousands of light years away. Once data from SDSS is available, teams such as Beth's can analyze it for high-concentrations of red-giants in small regions of the sky. Their presence can indicate an unsupected dwarf Galaxy or a globular cluster. Spectrographic information is used by teams such as Beth's to filter out fainter - but far closer - red stars within the Milky Way itself. Finally a more detailed view of the study can be made using higher sensitivity instruments at other observatories. Once data showed that a UMa dwarf Galaxy might exist, the 2.5 meter wide-field camera of the Isaac Newton telescope in the Canary Islands helped determine its general appearance. Images from the Newton telescope plus data from SDSS was combined to verify the nature of the study as a spheroidal Galaxy and not simply a rogue globular cluster - such as the Intergalactic Wanderer (NGC 2419) in Lynx located at a similar distance in space. Although smaller dwarf Galaxies have absolute magnitudes similar to the brightest globular clusters, one important difference between large globulars and small dwarfs lies in their size. The UMa dwarf is roughly ten times as large as the largest globulars known. And much of its mass is likely to be non-stellar "dark matter" - while nearly all the mass in a globular cluster is packed into stars. Since it's large, but not very luminous, the team has tagged UMa as a dwarf galaxy. From a cosmological perspective, satellite Galaxies such as the Ursa Major dSph play an important role in explaining the formation of large, intermediate, and smaller scale structure throughout the Universe. On the largest scales, spiral Galaxies (such as our Milky Way and the Great Galaxy of Andromeda) are known to dwell in extended groups of Galaxies called groups and clusters. Our own group (the Local Group) is small in mass and extent while its two largest members, though large by spiral Galaxy standards, are quite modest in comparison to the largest Galaxies known to Astronomers (the giant ellipticals). The very largest scales of galactic formation in the universe include thousands of large Galaxies while our own local group has but several dozen members. On the very smallest scales, the Milky Way and its retinue, which include the two irregular Magellanic Clouds plus now ten dwarf sphericals, make up a single gravitationally bound contingent. Because of this, Astronomers have an opportunity to explore the smallest possible building blocks of extragalactic structure. In their paper entitled "A new Milky Way Dwarf Galaxy In Ursa Major" Beth and her team go on to say, "UMa was detected very close to our detection limits. Numerous other dwarfs with properties similar to or fainter than the Ursa Major dSph may thus exist around the Milky Way... it is reasonable to expect that 8-9 additional dwarfs brighter than our detection limits still remain undiscovered over the entire sky. If true, that number would preclude (galactic formation) models that do not predict the presence of many ultra-faint dwarfs."